THE LARGEST COLD BEER SELECTION IN LANGLEY! COME CHECK OUT OUR GREAT CRAFT BEER SELECTION INCLUDING THE FOLLOWING BREWERIES AND MORE Andina | Backcountry | Bad Tattoo | Big Rock | Bomber | Breakside | Bridge | Category 12 | Central City | Dageraad | Dead Frog | Deep Cove | Driftwood Fernie | Field House | Foamers Folly | Four Winds | Fuggles & Warlock | Glutenberg | Gulf Island | Howe Sound | Hoyne | Kona | Lagunitas | Lakefront Lighthouse | Mariner | Maui | Mill Street | Moody Ales | Mt Begbie | Off the Rail | Old Yale | Parallel 49 | Parkside | Persephone | Phillips | Postmark Powell Street | Red Truck | Rogue | Russell | Sierra Nevada | Smugglers Trail | Spinnakers | Steam Whistle | Steamworks | Steel & Oak Strange Fellows | Strathcona | Tin Whistle | Tofino | Trading Post | Twin Sails | Unibroue | Whistler | Yellow Dog Limited time offers, while quantities last. Prices subject to change. Advertised prices are plus 10% Liquor Tax and 5% GST. Valid only until June 30, 2018. No cash value. Not valid with any other sales offer or discounted items. Only one coupon per customer per visit. 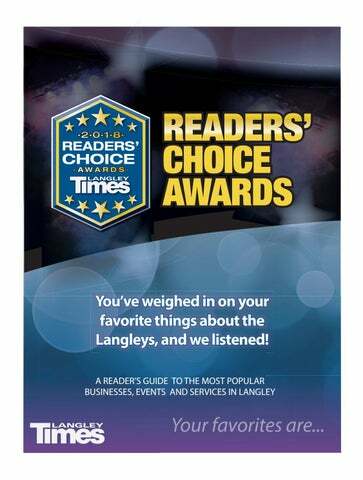 Welcome to the Langley Times 4th Annual Reader’s Choice Awards! In May we asked our readers, in the form of both online and print ballots, to name some of their favourite places, businesses and spots to enjoy in Langley. The list included everything from restaurants and hair salons to favourite place to buy a new or used car or your favourite biking trail and everything in between. Your response was once again huge, we appreciate everyone who took the time to enter. Throughout these pages you will see the top three favourites from the contest. Thank you to all the businesses that have supported this feature and a big congratulations to all the finalists and winners! A big thank you Katy Mayrs winner of the Samsung Galaxy Tab E for sharing her favourite things about our community with our readers. And remember, by shopping locally, you will help our vibrant business community grow even more. Thanks again and enjoy our Reader’s Choice Awards section. to all our wonderful donors and customers. We appreciate you r ongoing suppor t.
Thank you to our customers and staff for making us your favourite Grocery Store. Penny Pincher Thrift Store and the READERS’ Hospital Gift Shop are selling the CHOICE 2018 Community Cookbook as FAVOURITE part of their fundraising efforts. GREEN BUSINESS This year’s theme is Cook for the Health of It! Featuring healthy recipes from local chefs, foodies and nutritionists. 100% of the proceeds support the fundraising initiatives of the LMH Auxilary. Pick up your copy today for a minimum $5 donation. Check out our expanded meat and seafood department or carvery station or maybe it’s sushi night? If you’re looking for dinner ideas, pick-up a hot & ready meal from our kitchen where meals are prepared fresh daily. Our team of over 170+ dedicated real estate professionals are ready to help you, whether you’re interested in Residential, Commercial, Recreational, Investment Property, Sales, Leasing or Property Management. One Stop Sweet Shoppe in Langley City! Goody Bags | Bulk Candy | Sugar-free selections Root Beer Specialists! | In-Store Bakery Candy Buffets | Custom Candy Bouquets | Ice Cream Fresh Gourmet Fudge | Nostalgia & Retro Candy! OVER 70 VARIETIES OF ROOT BEER! Thank you to our many sweet clients for making us your one-stop sweet shop! SCHOOL, SPORTS TEAM OR CONCESSION? ASK US ABOUT FUDGE SALES FUNDRAISERS! to our customers, staff for voting us as a Favourite Produce Store! for all your votes and support! Lemon is a family owned and operated bakery supporting local farmers, growers & suppliers wherever possible. We bake from scratch daily using 100% butter and no preservatives. Our sandwiches are made to order with house roasted meats and partner nicely with our daily salad, soup & fresh squeezed lemonade. We brew organic fair trade coffee locally roasted by Fort Langley’s Republica Coffee Roasters. Custom Made Upholstery. Choose your Style. Choose your Fabric. Locally Made. We Also Carry Solid Wood Furnishings for your Entire Home. Celebrating 40 Years in Langley! Excludes Pond Liner & Gift Certiﬁcates. In stock items only. Regular priced merchandise only. All sales ﬁnal. for choosing us as one of your favourite independent coffee shops. We Are Proud To Be Serving Langley and Would Like To Say Thank You To All Our Customers, Voters and Staff. Thank you FOR YOUR VOTES Without our wonderful clients, friends and family this wouldn’t be possible. We appreciate each and every one of you. 604.888.9000 • www.greatcanadianoilchangelangley.ca Drive-thru Oil Change • Drive-thru Filter Service (air, cabin & fuel) Drive-thru Wiper Blades • Drive-thru Head Lights 23-Point Service Check COMPLEMENTARY NEWSPAPER, COFFEE & WIFI WHILE YOU WAIT. for your amazing support and votes for us in the Favourite Pizza category! serving the highest quality pizza in Langley since 1979! Try our Gluten Friendly Dough! At An Indian Affair you’ll find most exotic and mouth watering Indian dishes prepared in most healthy and hygienic way. In gratifying your taste buds we don’t neglect your health. Our culinary art is a rare combination of scrumptiousness and salubriousness. In serving you the great Indian flavours we fuse the traditional cooking with a touch of freshness and dollop of our own innovative signature style. We are proud of our work with these and many other charitable organizations and we are proud of the community we live and work in. All of us at Magnolia Gardens are honoured to be chosen by Langley Times readers as one of your favourite seniors communities. We appreciate your support! Each month, Otter Co-op collects donations at all of our locations, reinvesting them in the community causes that our guests care about. We are currently collecting donations for the BC Floods Appeal with the Red Cross. Thank you for all your votes and support over the years! Dr. Grace Wong Phone for details. We want to thank all our valued clients for voting and supporting us! Langley Decorating Centre is proud to be an independent Benjamin Moore paint retailer store serving the Langley community. We offer over 30 years experience in the paint industry. We’re proud to deliver the kind of specialized attention to detail and help that you simply won’t ﬁnd in larger chain stores. Our in-store paint specialists/colour consultants are comprised of the knowledge and helpful advice that will ensure the success of every project you have, large or small. Proudly gley Serving Lan for 22 years! Custom window coverings do more than cover windows. A well-dressed window changes a room from just four walls to a place of special warmth and character. We carry the latest fabric colors and textures available from Silhouette shades, faux wood Venetians to vertical blinds. Colour Consultations Having trouble picking the perfect colour? Why not have one of our experts come to you? We have Interior Decorators on staff who will help you pick the perfect palette for your home. Call us today to book an In-Home Colour Consultation. 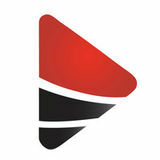 For all your auto, light truck or RV repair and maintenance, give us a call. We’re local and we’re here for you. C a l l o r v i s i t o u r w e b s i t e f o r m o re d e t a i l s .
Congratulations to all the 2018 Langley Times Readers’ Choice nominees and winners! DISCOVER the best ingredients with us. THANK YOU LANGLEY! WE’RE THRILLED TO BE HERE. We appreciate our customers and staff for the support and patronage for an amazing 45 years! The Cookie Monster Preschool has been serving families since 1972 at the Douglas Recreation Centre. Over time the program has developed from a recreational program to a licensed preschool. We are proud of our history and the quality of our preschool. Spaces are still available for our 2018/2019 School Year. To register or for more information, please call Douglas Recreation Centre at 604.514.2865. Favourite Patio and Fine Dining - Finalist Thank you for voting for Cactus Club Cafe Langley in the Reader Choice Awards. 604-534-6311 Proudly supporting Canadian manufacturing. We would like to thank all our patients, dentists and senior care communities for your loyalty and continued support of our clinic. rving Proudly Se , y le g n La lley a V r e s Fra w o and L er Mainland! Now Offering Suction Dentures NEW PATIENTS WELCOME! Dentist referral not required. Thank You Langley for voting us your Favorite Fashion Store! We accept all dental plans and submit directly to your provider. You only pay your portion! for your appetites, support, and patronage. *Limited time offer. Valid from June 13-30, 2018 (**NO EXTENSION ON SALE DATE – CANNOT BE COMBINED WITH ANY OTHER SPECIALS**NO EXCEPTIONS). Does not apply to previous orders. No exceptions. See Clinic for more details. We are located in Simonds Elementary, however our programmes are open to all children in the community. Thank you Langley for your vote of confidence! Pre-school programs for children ages 2 1/2 to 5, before and after school programmes for children ages 5-10. Licensed facility and all staff have ECE and first aid training. We also have programmes for Pro-D days and summer. All hair clippings, extensions, any excess colour and developer, papers and plastics, foils, aerosol cans and colour tubes from Milica SalonSpa are collected by GCS - effectively cutting down our salon’s total waste, literally overnight, by 85-95% ! * Special for a limited time only. For optimum reasults book 4 weeks apart. Thank you for voting us as one of your Favourite’s in the Langley’s Reader’s Choice Awards. Is your car ready for your summer road trips? Revitalize your health in 30 days! Joint Formula 14 is a consumer favourite for anyone suffering from joint pain or reduced mobility. The unique clay-rich mineral structure has strong anti-inflammatory and detoxifying properties. It helps remove toxins from the body and flush them through the digestive system, while being easy on the stomach. Enjoy your day without the pain, guaranteed results in just 14 days! For a limited time get 2 free Power Pouches in every Pitcher box while supplies last. Enjoy mineralized, alkaline water at home with the Santevia Alkaline Water Pitcher. This convenient, hand held pitcher fi ts in the door of your refrigerator, and restores your tap water to its mineral-rich-state, just like nature intended. With a Santevia Alkaline Pitcher you’ll not only help maintain you body’s healthy PH balance, but you’ll also save money you would have spent on expensive alkaline water bought in the store. Probiotics perfect for pockets, purses, and on-the-go people. Primadophilus Optima makes getting your daily probiotics easy. One capsule a day, 50 billion CFU, and no refrigeration required. Our Optima line of products include researched strains in a delayed release, gluten and daily free capsules. Available in our Digestive Balance, Women’s and our new Adult 50+ formulas. LEAN WHEY™ Protein Powder Revitalize your health in 30 days! Prairie Naturals Enzyme-Force with FibraZyme is a comprehensive digestive enzyme blend that provides a full spectrum of enzymes for the optimal digestion of proteins, carbohydrates, fats and fibre. EnzymeForce with FibraZyme is non-GMO and is encapsulated in V-Caps. Suitable for vegans. Renew Life CandiGONE CandiGONE is a 15 day herbal program for those suffering from Candida yeast overgrowth. It contains herbs that help in digestion and also relieve symptoms of urinary tract infections. Candida should also be treated by eliminating certain foods from the diet including, but not limited to sugar, yeast, most grains, vinegar and mushrooms. For many people, Candida requires multiple months of treatment with diet and natural health supplements. Ultimate Flora Critical Care delivers 50 billion probiotic bacteria from 10 strains. You would need to eat over 50 servings of yogurt to equal the probiotic power in just one capsule of Ultimate Flora Critical Care! Ultimate Flora Critical Care is the ideal formula for improving digestion, boosting immunity and supporting overall health. Ultimate Flora probiotics are enteric coated to protect the probiotics from harsh stomach acid and deliver them directly to the intestines where they are needed and utilized by the body. Earn and redeem RBC rewards® points on your vacation. Plus get BONUS points when you redeem, exclusively with CWT. ®/™ Trademark(s) of Royal Bank of Canada used under licence. Be calmer and more energetic! Super B-Force 50 is a high-potency B complex with all eight B vitamins including the most active, bioavailable forms of B6 (P5P) and B12 (Methylcobalamin). The whole family of B vitamins works together to support adrenal function, help calm and maintain a healthy nervous system, support normal growth and tissue formation, enhance immunity, and reduce blood levels of the amino acid homocysteine which are linked to increased risk of heart disease and stroke. Contains 1000 mcg of folic acid, essential for all women of child-bearing age. THANK YOU for all your votes and to all of our dedicated customers and staff! Independent Living with Optional Care Available 24/7 if needed. Delicious, nutritious meals that are Chef Prepared! Active Lifestyle options with Seniors Fitness, Shuffleboard, Yoga, Carpet Bowling & more! Parties, Entertainers, Pub Nights, Socials and more! Join us every Friday & Saturday for Live Music & Dinner! for voting us your favourite for over 55 years! Port Kells - 19840 96 Ave Walnut Grove - 8730 204th St Langley - 6241 200th St Murrayville - 22259 Fraser Hwy Campbell Heights - 2725 192nd St.
We appreciate your support and for shopping locally! The Wickertree is a family owned and run business celebrating more than 15 years in Langley! 604-530-0818 www.thewickertreelangley.com SUMMER HOURS: Sun-Mon 12-5 ~ Tues-Sat 10-5 *Some conditions apply. See in-store for details. We have amazing clients and we are extremely thankful for them trusting us with the purchase or sale of their properties. THANK YOU to each and every one of you! We take pleasure in the work we do and the friendships we build along the way. Your vote of conﬁdence in our group is the icing on the cake. We look forward to growing our relationships further and helping you with all your residential and commercial real estate needs in the many years to come. Thank you Langley for all your support! Thank You Langley for Caring About Us. Welcome to Peregrine House School Inspiring a passion for learning. We invite you to spend some time with us on four beautiful acres in Langley, BC. We will share with you why we believe the environment plays a significant role in each child’s educational experience. Each day Peregrine House School is a place of community and collaboration where children can engage in a multitude of new and enriching experiences while in the comfort of a familiar and secure environment. • Engaging musical, art and • We provide 24-hour professional, horticulture therapy programs, person centered care. as well as pastoral care. • Single rooms afford privacy and dignity. • Private placement available, • Our contemporary residence is elegant, call now for an appointment. modern, safe and comfortable. We are a culture that allows the child each day to build their character through student-led activities that are purposeful, beautiful in their design and inspire a passion for learning. NO Antibiotics or Animal By-Products in our Meat & Poultry. RAISED WITHOUT ADDED HORMONES. DAIRY Avalon & Valley Pride Dairy, Farm House Cheeses & More! SIDES Salads, Fresh Daily! Variety of Pickled & Preserved Items. DELI & GROCERY ENTRÉES Meat, Pasta, Vegetarian & Gluten Free. Ready to Cook! MEATS Available in Nitrate Free, Low Sodium & No Sugar. Thank you Langley for the Vote of Confidence! Cora Langley is honoured to be amongst those nominated for the Favourite Breakfast/Brunch category! Thank you to our guests, the readers of the Langley Times, who have truly shown their appreciation of Cora’s creative breakfasts. We couldn’t have done it without you! FREE fruit cocktail! With the purchase of a $9 meal or more. Present this coupon before ordering. One coupon per customer per visit. May not be combined with any other offer and has no monetary value. Offer valid until August 12, 2018, only at the Cora restaurant located at 20670 Langley Bypass. No reproductions will be accepted. Any flower arrangement of $40 or more with this voucher. FLAT DECK AND TOW SERVICE Thank you Langley for voting us one of your Favourite Towing Companies! Valley Natural Health in the heart of downtown Langley. We are the oldest health food store in the Fraser Valley and proud to be serving the community for over 50 years!! We carry various supplements, bulk food and bulk herbs. We will match any print advertisement pricing! Thank you to all my valued customers for voting me their favourite chef! TO ALL OUR VALUED CUSTOMERS! Thank You Langley for your votes & support over the last 3 years. We are really pleased that you have recognized the effort we are making to improve your experience over the years on all levels starting with our superior customer service to our equipment & cleanliness. We are absolutely delighted to maintain our top position and we wouldn’t be there without your loyalty and support! 604-888-8915 8590 - 200th St.
Now hiring F/T and P/T team members. CEFA Walnut Grove offers a full day early learning program designed for infants and children up to five years old. The enriched curriculum features a unique partnership of core subjects, such as Reading, Math, STEM and Fine Arts including Yoga, and Music, providing your child with the freedom to learn and grow through play. Walnut Grove Summer Program During the months of July and August, your child will participate in four out of six distinct Summer classes selected by our school. CEFA’s Summer Program offers children the opportunity to develop their creative and social skills through a variety of fun-filled Summer co-curricular activities. The program incorporates CEFA’s unique methodology as well as our own CEFA curriculum based games and projects. Thanks to our customers for voting for us! THANK YOU LANGLEY! THE BRICK IS HONOURED TO BE NOMINATED FOR THE LANGLEY TIMES READERS’ CHOICE AWARDS. THANK YOU TO ALL OUR VALUED CUSTOMERS, FAMILY AND FRIENDS, FOR YOUR VOTES AND CONTINUED SUPPORT. Come in and explore our store. your major appliance purchase of $999 or more. Excludes Amana, Midea, Moffat, Inglis, Whirlpool, Hisense, Kitchenaid, and builder or commercial products. Limit one per household. Valid June 13 - 30, 2018.